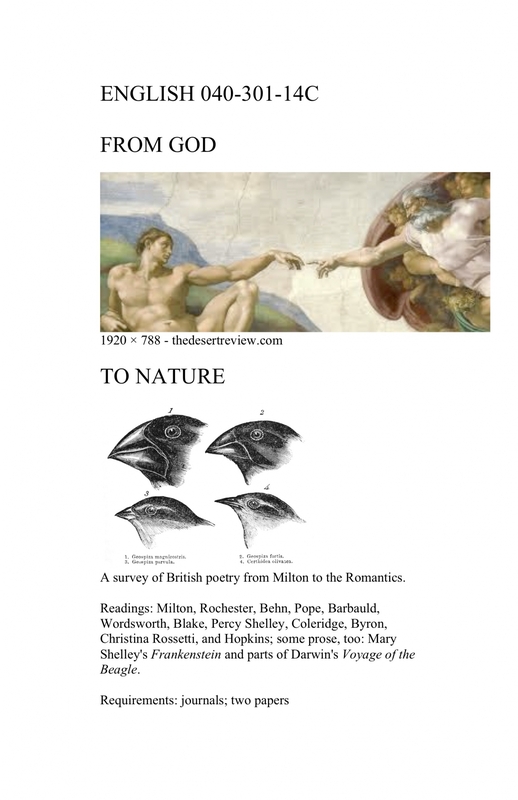 This course is a survey of British poetry from Milton to the Romantics. We will read poems closely while keeping the larger questions of the changing social functions of poetry in view. Poets will include: Milton, Rochester, Behn, Pope, Barbauld, Wordsworth, Blake, Percy Shelley, Coleridge, Byron, Christina Rossetti, and Hopkins. We will also read Mary Shelley's Frankenstein and parts of Darwin's Voyage of the Beagle. The class will involve discussion; journals; and two papers.